Finding the most effective product and diligence on followup treatments are absolutely needed to eradicate a flea problem. This is a guide about nothing is working to get rid of the fleas. I have 5 dogs in my house as well as 5 children. I have a flea problem. My question is: how to I kill the fleas, eggs, whatever that are on all the piles of clothes in my kids room. They leave all their clothes on the floor and I'm sure they are loaded with fleas, because they are everywhere else. Also what do I do with their stuffed animals? I am about to go crazy. I have a very large house also (3600 sq. ft. 2 floors) so bombing and spraying is very expensive, and I'm not sure it is working. At the moment, I am sitting with a towel on my head with Dawn detergent rubbed into my head and hair. Please help. The important thing to remember is when treating one animal for fleas to treat all of them. What I do is I get the largest Advantage for dogs. Most vets will sell a tube singley for around $17. Then I pore it into a medicine bottle and then extract it with a needless syringe. I put three drops on the bigger dogs and two on the medium and one on the smaller dogs. Cats also need to be done. Do all of them at once. The fleas in the house should die too along with the fleas on the critters. The fleas are usually dead within an hour. I found out this trick from an ebay seller. I can use one tube to do all 7 of my dogs and 5 cats. I treat them every month and a half the same way every time. I never see fleas at all. Before I started doing it this way I had a horrible flea problem. They were eating me too..LOL. Good luck! Rule of thumb, flea eggs hatch every two weeks. Vacuum every day, empty the bag,container every time you vacuum, do not wash dogs with flea shampoo, or a shampoo with detergent - use a non detergent shampoo, so when you put a flea application on your dog, it doesn't wash off. Also, something to remember - Advantage can be used on your dog/dogs every week until infestation has been killed, or frontline every two weeks. Or, in some cases, you can alternate. That is expensive, but that is really the only way to get rid of them. Also, the piles of clothes need to be picked up. They are adding to the problem. I have 3 cats and 2 dogs in my house and this is the only thing that works. I beat an infestation of fleas in Florida with Borax. I used a jar with nail holes in the lid to sprinkle it. It sifts through the carpets and some of it stays, even after vacuuming, where it will kill the emerging fleas. It does not harm kids or pets, and as a bonus it's a good deodorizer. Use it every night after the kids are in bed, and vacuum in the morning. (If you have five kids, some of them must be old enough to help with this.) You can add bay leaves and whole cloves to the mix to add a nice scent, if you like. You may want to treat the outside of your house with a chemical spray. But all of this is useless if you can't get them off your pets; you have to tackle all of it at once. The vets have a preparation called Capstan which will instantly kill all fleas on an animal; it is not a preventive but may work just to get you started on the problem. You really need your vet's advice on the best way to proceed; once you have a plan, if it's cheaper to buy the products at the store go for it! Also, be absolutely certain that you do not use a dog flea preparation on a cat; it can and will kill the cat. Side note: I, personally, have never heard of fleas living on someone's head. Fleas bite and jump off. Are you sure they are not headlice? About 2 cups of dry 20 mule team Borax for average size carpeted room. Sift over carpet. Leave for 2 weeks to get larvae eggs and adults. only then can you vacuum. You will not have fleas in your house for over a year. Your yard has to be done, as well as your bathing animals. When there is a severe problem and the dogs can't stop itching, I give in to using sevin dust. Wow, you're in for a big job! I recently moved to a new apartment that's only about 700 square ft and it turned out the tenants before me had an indoor outdoor cat and sadly the landlords didn't spray after they left. Within six weeks I was totally infested and my poor eight year old indoor cat who had never had fleas was going crazy! While waiting for pest control to come spray (a week) I used Frontline on her. That helped her a lot but fleas were everywhere. Anyway, night before the spraying a neighbor came and helped me give her a good bath (dish soap only) and whisked her away to his apartment for the night. Then I shook out all area rugs and bedding, thoroughly dusted from top to bottom, then vacuumed everything including under cushions (leaving them in a standing up position), all the floor boards even in the bathroom and kitchen. Placed all dirty laundry in a large plastic bag. Went to bed. Next morning, just to be safe, placed all loose food on the counters into the fridge or empty dishwasher, lifted up the bed skirt, opened all closet doors and linen cabinets, made sure all windows were closed, placed the area rugs back down and waited. When he got here I let him know I was worried about areas where I am not physically able to move them for vacuuming. He slightly moved them out so I could push them back. He ended up spraying under the bed, closet floors, behind the large furniture and under the cushions, along all carpet and linoleum edges and, of course the carpeting. He also sprayed around my patio and entryway. Had to stay away for four hours and then air out well for an hour. As large as your house is and for the amount of pets you have you need volunteers to help, and I hope you spend the money for a pest company because they are the only ones who can get their hands on the safe for you and your pets chemicals that will do the job first time out. It kills not only the fleas but also the eggs, pupae and larvae. There are so many good answers here, but it boils down to: Don't allow pets outside (even cats). If they have to go potty, make sure your yard and your neighbor's is sprayed for fleas at least 2 times a year (3 is better). If you spray your own, it costs about $10. You can get it at Home Depot or Lowe's for. When doing yours, do your neighbor's, too. Fleas jump about 15 feet or more and can come in via other people. If your friends have fleas, you will. They can come in on clothes and shoes. You can't be lazy about fleas The first scratch by a pet, you'd better be digging in to find it. Period. 5 kids? You are busy. Now, 5 pets and hundreds of thousands of fleas added to the mix and you are really busy! You have to do what is said here, and you have to do it all in one day. Within a few hours you have to have a "team" of people to help you and get it done. If you don't do it all at once, within a few hours, you will never cure your problem. Just like some others said here. Take the pets to a groomer. Better yet to a veterinary clinic. They will need to be checked for worms too, which means the kids can catch worms, too. Let them know the problem before you get there. Ask them to keep the pets for the day, and groom and de-flea. Flea infestations cause worms in pets and humans. I didn't say this was going to be cheap! If you want cheap, then ask friends to help you. Take the pets to their homes, and have them bathe and groom with groomer recommended flea products. If it is that bad they probably need a real groomer and nails clipped, etc. Do the yard first, on a day it isn't raining or snowing. 8 hours later you can water the lawn, and wash it into the ground. It will help kill fleas there. In 10 days you should do the lawns again, because flea eggs hatch! New fleas may also appear, so kill them. Then bug bomb the house, garage, and porches. Be careful of plants and fish tanks (turn the pumps off and cover fish tanks completely). Take birds outside, or put them in the garage. And do the garage last after things have been moved inside. Take all clothes with you to the laundromat, after spraying lawn and starting bug bombs inside. Don't skimp, buy enough bug bombs! Know when you return to air the house out that you will need a team to help you clean up. You will be washing dishes, cleaning floors, washing down bathrooms, tile, tub, and sinks. You also may have to clean windows, as it will probably film them up a little. Carpet; hopefully it can be saved. And hopefully the bug bombs will save your carpets, too. If not, you will be replacing them. Maybe get tile? Then you can be lazy about it somewhat. And get some of the stuff you sprinkle on carpets for fleas. Just sprinkle some and sweep it up. Know that you will be sweeping under furniture, behind fridge and stoves, move everything. Beds need to be cleaned under, linens will have to be changed, and you may want to even take down curtains and laundry those after you air out the house. Fleas lay eggs everywhere! You should change your furnace filter after bug bombing. Do not turn on furnace or a/c until you change the filter first. Fleas go everywhere and they may have gotten into the filters too. Oh and by the way, turn off a/c and furnace before you bug bomb. Have your team clean all toys and put them away, wash all stuffed animals that can be washed and throw the rest away. Turn all electronics off and pull the plugs. Cover them with a sheet or you may regret it. When washing laundry you may try the borax laundry soap, too. It won't hurt. Since you have a huge flea problem, 5 kids, and lots of pets, I usually discourage the use of Front Line for any pets but, I think you need it. I do not like to use any topical treatments on my pets. I never have and never will. But emergencies are different, and you have an emergency. So I would get it, and after they are groomed have the groomer or vet put it on them before you take them home. Tables and cooking surfaces must be cleaned really well. You will need to take out silverware, cookware, etc. and clean it all again. Good time to clean cupboards and put down new paper, etc. Now, know that in 10 days you are going to need to do all of the above again. Pets can go to someone to be groomed, so stay there again until the house is ready to come back to. Oh, and on pets, make sure their beds are in the washer. Use hot water and run through the wash 2 times, then dry. You will want to buy a bug spray to use on the pet beds. Check out the pet stores for that, or ask Vets or groomers. Combs, brushes, etc. all should be cleaned up of all hair, and if possible put them in the dishwasher and run it. It will disinfect them, and hot water kill anything on them. Also, ask the Vet what they would recommend for a de-wormer for all pets. They may give it to them while they are there. Usually you give a dose and then follow up in 3 wks. Good luck. I am itching just thinking about fleas! Thank Goodness I keep on top of it. PS. The picture of the dogs I put on here have never had fleas. The chihuahua is 13 yrs old! 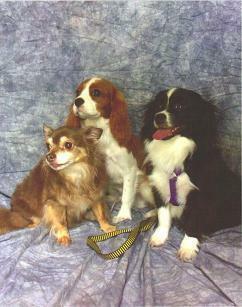 Tiki, Skeeter (Cavalier), and Fancee are rescue dogs. I do the yard 3-4 times a yr. and never do I use Front Line. If I do the yard, I don't have to use a flea preventive on the dogs. I use dog baby shampoo on the dogs 2 times a month for grooming. That's it! Living in FL, I bug bomb my house in spring and fall, just because of creepy crawly bugs anyway. I am going crazy with fleas on my dogs and cat. I used borax, the pets are protected with Frontline, brewer's yeast in their food, and I bombed my apartment. I don't know what else to do. My pets are going crazy itching. I am going to try the pans of water and a drop of soap. Please help. If you have pets with long hair and matted fur, it's likely the fleas are living in the matting and it's hard to kill them. You may need to cut their fur short and take them to the groomers to get it done if you're not comfortable doing it yourself. The pets will have lots of time to grow their fur back before winter months arrive. A battery operated flea comb run through their shorter fur will also zap fleas, but fur needs to be short in order to get them all. Forget Frontline. Frontline stopped working last year on all my dogs. Forget brewer's yeast, most dogs are allergic to it. Sprinkle salt all over the carpet and all over furniture, under it just everywhere. Let it sit. Vacuum everyday and tape over the end of the vacuum or cover it and also if you have a bag put a flea collar in it. Get a flea comb and go over them with it once a day and put the fleas in warm soapy water. This is a great way to get rid of fleas. Take the dogs and bathe them in Dawn and leave it on them for a few minutes. Don't get it in their eyes. Then after they are rinsed several times, spray their coats with white vinegar and then rinse if off. I have heard that Skin So Soft is good for fleas; I am not sure. I have heard of putting 1/4 tsp apple cider vinegar per cup of water for dogs, no more than this. If it makes them itch, stop it as they are allergic to it. I would go to Dr. Foster and Smith dog and cat supplied and check out diatomaceous earth, it non toxic if ordered from this company. Don't use the kind you buy for the pool it is not the same and is toxic. On top of all this, I would put apple cider vinegar in a shake bottle and dilute it with water half way. I would then spray them with this every so often with it. It is nontoxic. Check out earthclinic.Com and mercola.Com about their pets' section. I would also get a small spray bottle and put lemon juice in it and then keep it filled and spay their neck and base of their tail on top of them with this. Fleas hate citrus. Cats do too. Be aware that most essential oils are toxic to pets. Good luck. Frontline has changed their formula, it no longer kills fleas, it used to be great and now. Nothing. Zero. Try Comfortis, the pill that lasts for a month, and then if you don't like that try Advantage. Never use over the counter spot treatments they are toxic. Short of any chemicals, I would shampoo, vinegar, and rinse and do the flea comb every day for a couple of times a day at first, vacuum all the time, salt over the floor all over everywhere. And then see how that works. Good luck. And check out the sites i mentioned and all the things that are archived on this site! I also found that Frontline was no longer working. Heard somewhere that the Company was sold and the formula was changed (not sure if this is true). I changed to Comfortis (pills) and so far so good. Only problem is no tick protection, but for that I use Ortho Max both spray and granular on the yard and shrubs and that seems to work. This is really sad. You'd think with all the vets in this country, at least some of them would have heard of using the old original Blue Dawn dish washing liquid and the use of food grade diatomaceous earth. Especially the diatomaceous earth which has been around and used by farmers even for years. If you live anywhere near a farming or ranching community, you could walk into any feed store and find diatomaceous earth and maybe the Dawn too since those two products are the best cure for fleas on pets and other animals. The food-grade diatomaceous earth is even the best protection against internal parasites and when I had horses, it was regularly sprinkled on their favorite food to make sure they got it all. It was also brushed into their hair when grooming. Our 3 cats don't go outside at home, and the dog only goes out a few times a day, but when we camp, the dog goes with us. So far, he's not come home with any "free-riding" critturs in his fur. I still give him a bath in the Dawn first thing just to be on the safe side. I do not trust any of those chemicals that go on the necks of my pets for their little bodies to be taking in all the time, and I'm not about to put a flea collar on one of them either for the same reason. Some remedies are just so simple that many people refuse to believe they work. I hope this will help you. Fleas can end up causing your pet's death if not treated and gotten rid of. I had a flea problem with my cats a few yeas ago. They were inside cats so we were bringing the flea eggs in on our feet I guess. It was terrible and they were biting me too. My vet reccomended Advantage over Frontline, but I also was told to vacuum twice a day for two weeks. Those fleas are constantly laying eggs and they need to be vacuumed up before they hatch. Use flea powder on the floors then vacuum it up into the vacuum bag so it will kill the live fleas and eggs when they hatch in the bag. You can get rid of them but it takes about two weeks. After that continue to use the Frontline as directed. The grocery store kind will not do the job and will make many pets sick. A good bath always helps, but cats don't like it. I have an 8 month old American bulldog with fleas from the neighbor's dog. Now they are in the house. I have tried the salt, Dawn, borax, flea dips, flea shampoo, monthly treatment the you put on their back of the neck, and flea bombs. Please tell me what else might works. I had flea problems in my house, got online and started searching for a safe way, found out that Borox sprinkled on furniture and carpet works, and it did, I would sprinkled it in the morning and vacuum everything when I got home from work. There's a trick a dog breeder taught me years ago regarding controlling fleas outside. In her yard, she would sprinkle the granulated systemic rose bush fertilizer that kills sucking insects. It's something you sprinkle on the ground, the rain puts it into the soil, where the rose bush pulls it into it's system, then when the aphids or whatever eat the bush, it kills the bugs. I don't know how this equates to killing/controlling fleas outside in the yard, but she had loads of little long haired dogs and none of them had fleas. "As the festive days of summer wane in many parts of the country, one little parasite keeps the party hopping in warm, humid areas where he reigns. With nearly 2,000 species and subspecies, the flea thrives at temperatures of 65 to 80 degrees and feeds on the blood of the unsuspecting-especially cats and dogs. Know your enemy: Confirm your pet has fleas by identifying signs such as droppings or "flea dirt" in your pet's coat, excessive scratching and scabs. What goes around comes around: Treat all of your pets, not just those who show outward signs of infestation. Shine on, pet parent: Thoroughly clean your house, including rugs, bedding and upholstery, and discard any used vacuum bags. Honor and trim nature's gifts: Since fleas love long grass and shady outdoor spots, remember to treat and maintain your yard as carefully as your house. Doctor knows best: Talk to your vet about choosing the right, species-specific treatment for your pet, such as a topical, liquid insecticide applied to the back of the neck. Never use products for dogs on cats, and vice versa. Also ask your vet to recommend products for treating your yard. "Cats especially are extremely sensitive to insecticides, and pets can die from improper use of flea control products," says Dr. Steven Hansen, veterinary toxicologist and ASPCA Senior Vice President. "Just a few drops of concentrated permethrin, present in many spot-on treatments for dogs, can be lethal to cats." To avoid accidents, pet parents should read all product labels and follow directions for proper use. For more information about flea prevention and pet health, please read our top ten medical tips. And enjoy an itch-free end of summer!" I have worked at a vet for almost two years and I tell you that the only flea product I have seen getting a good efficacy is Revolution. Seriously. Ignore the Hartz, BioSpot, anything you can get at a pet store and go straight to the vet. Not only do storebought flea medications not work, but some also contain neurotoxins designed to kill bugs, but seriously risking your pet's health. I have a long-haired dog. I can't get rid of the fleas. I have tried Frontline, Advantage, and Advantix. I have sprayed the house and yard. Any suggestions? I have fleas in the house and have followed the advice on this site regarding Borax, salt, vacuuming, etc. Nothing has worked, I am finally getting an exterminator tomorrow.. I have fleas in my house that I can't get rid of. I have used Borax, flea bombers, and vacuum at least twice daily.